Throughout my academic studies, I had a textiles project where I could create a corset inspired by any designer for any client. 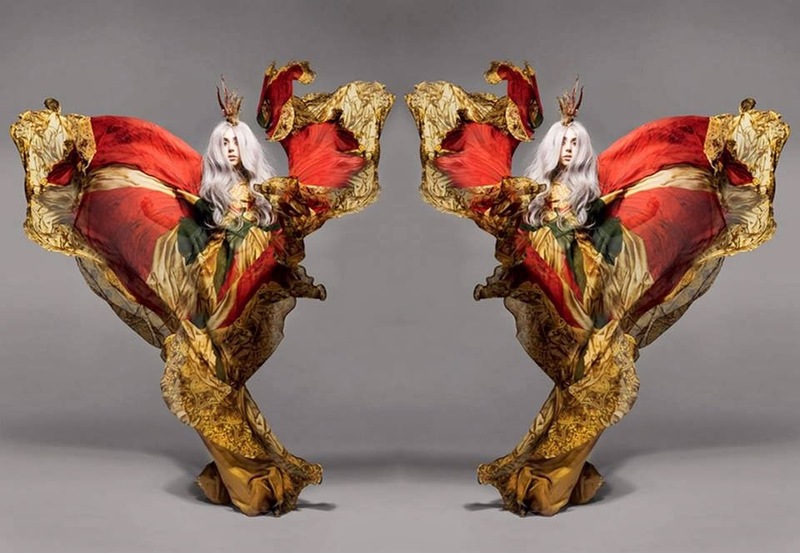 From doing research I decided I wanted to produce a one off piece for someone that was mould-breaking within pop culture, therefore I chose music phenomenon Lady Gaga.To compliment her quirkiness I was influenced to create a collection inspired by none the less Alexander McQueen. As I researched further into McQueen as a designer, I was intrigued by his theatrical catwalk shows, producing collections with extreme silhouettes and designs out of this world. I saw myself as a young aspiring designer who didn't want to create "just another" fashion product but a unique ground breaking piece, McQueen inspired me to be an innovative creator. I see myself as an individual who adores creative unique things in life. As a textiles student I decided to explore new worlds of fashion as people can be easily manipulated to follow mass media and incorporate mass culture into day to day life. McQueen tests boundaries of shapes and silhouettes and produces innovative fashion products like no other designer. It's encouraging to see that someone is willing to aspire and inspire to produce things beyond the boundaries that the supreme fashion society produces. He has had a huge influence on the industry and inspired young designers around the world that they must not limit their creative capability to matter what the restraints are of the industry saying no, designers must be free to create what they believe is beautiful. This graphic embroidered dress is one of my favourite pieces by McQueen as I love the crafted detail lace pattern created, which adds a couture-like feeling to the piece. 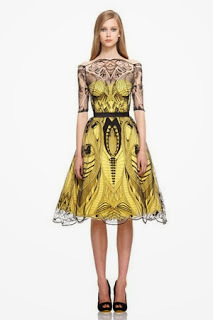 The black lace matches well with the yellow satin shift dress. 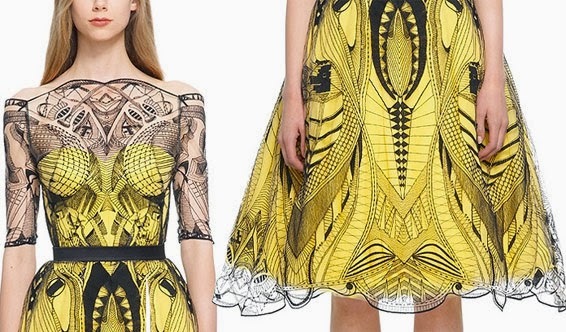 The decorative techniques emphasise the collar bone shape and enhances the femininity of the dress, however I believe this contrasts with the lacing as it provides a "tattoo" / "insect" essence on the skin, which gives a edgy glamorous final look. This was my favourite collection in particular because I love the use of prints and silhouettes, his designs are almost like pieces of art to wear. He never took on-board what was "in season" or redeemed as "on trend" he produced collections which would wow editors, bloggers and the mass media. This is what set him apart from other designers within the industry. -"If you always do what you've always done, you'll always get what you've always gotten." 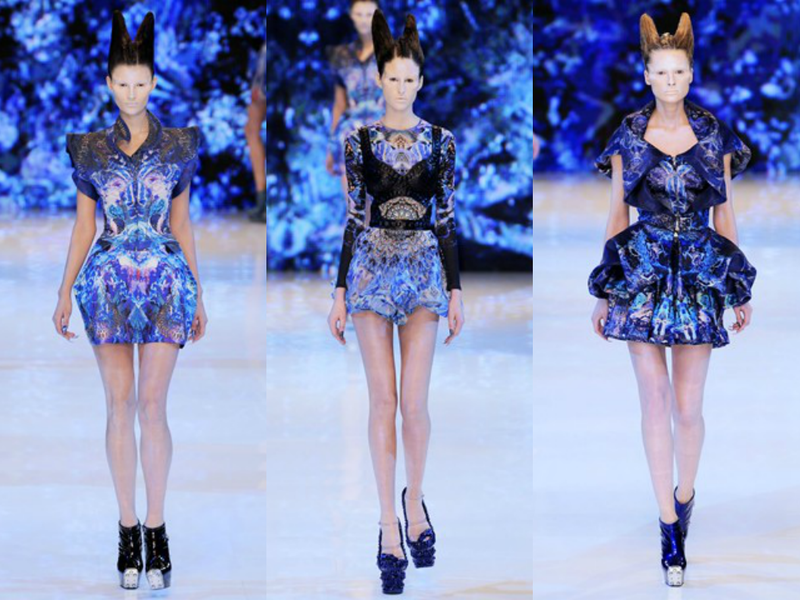 I believe in this competitive fashion industry it's good to be different, we should question why designers follow the design briefs set by corporate businesses: fashion is a form of art, freedom of choice to produce whatever you feel is beautiful which is exactly what McQueen rein-acts. His designs are carefully thought through and each decor technique has been designed to the tiniest detail on the smallest prints and embellishments which makes his work of art effortless. I love the colour schemes and prints used in this collection as they are geometrical. He takes risk in experimenting with different shapes and sizes, he takes a basic pattern pieces of a dress for example and incorporates or adds components such as panels to create something new. 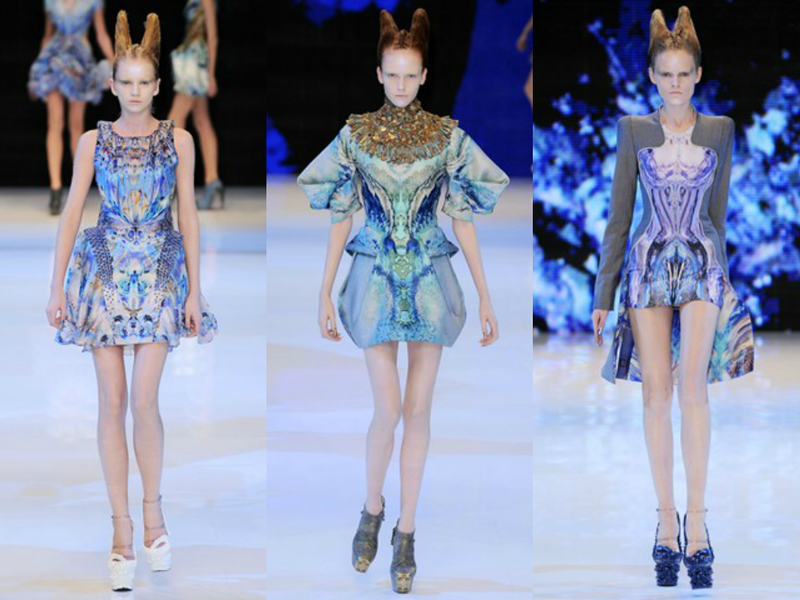 For example the photo in the middle has wider butterfly like sleeves. 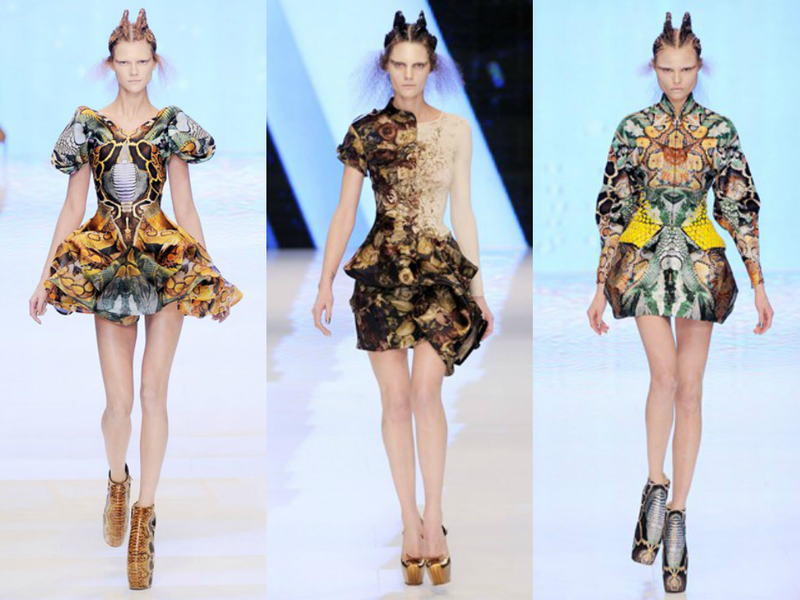 By creating new shapes, McQueen has created a new dimension for fashion. Through looking at McQueen's previous work, I have picked up that he is inspired by things completely out of this world and by incorporating them into his clothes he brings these alternate worlds to life. He emphasizes uniqueness even to the final details of hair/makeup/shoes. His collections provide an all round amazing fashion experience. 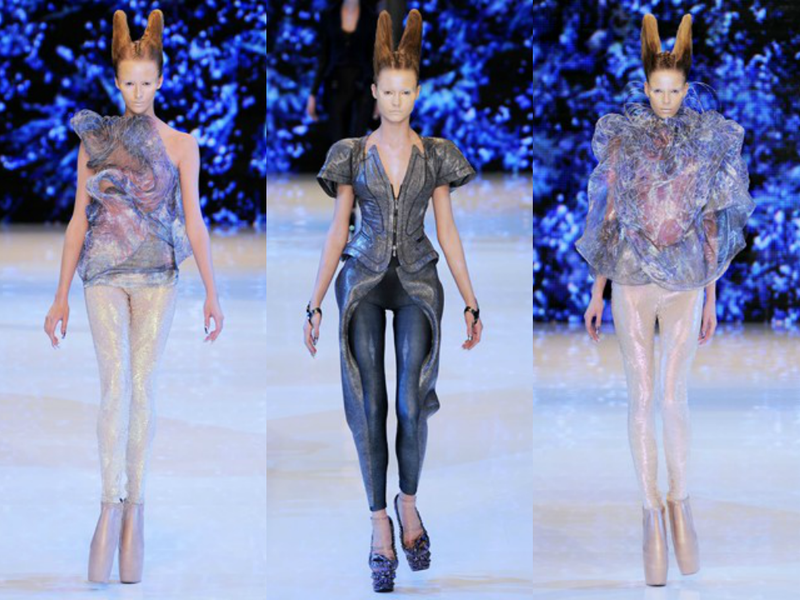 The use of sheer/shiny fabrics with a grey/blue/white colour scheme reminds me of something I saw in an Alien movie, it just proves that his design influences are out of this world, he the creates a theatrical show to preset to the world a new dimension of fashion. We are so used to seeing designers copy and reinvent classic pieces, you rarely see something new and fresh which is what fashion is about. 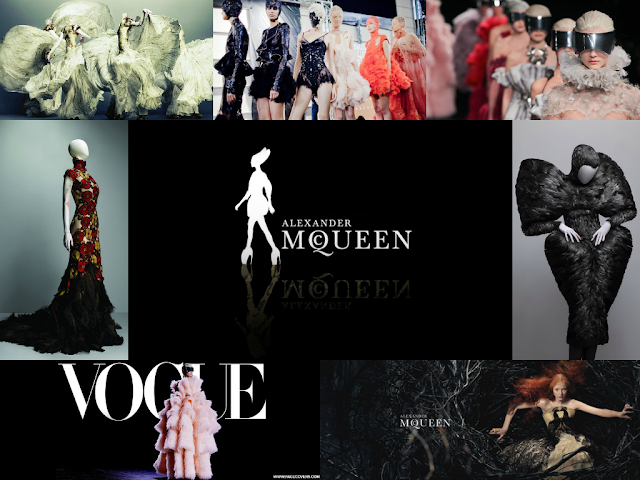 Last but not least, I would like to thank Alexander McQueen for showing me a diverse interpretation of the fashion world and I will continue to be aspired by his work as his legacy lives on by Sarah Burton.